ALBUQUERQUE, N.M. - Two juvenile suspects have confessed to pilfering an entire pumpkin patch that was cultivated by New Mexico preschoolers, police said Friday. According to investigators, the two boys admitted raiding a small pumpkin patch cared for by students at Eastern New Mexico University's Child Development Center. 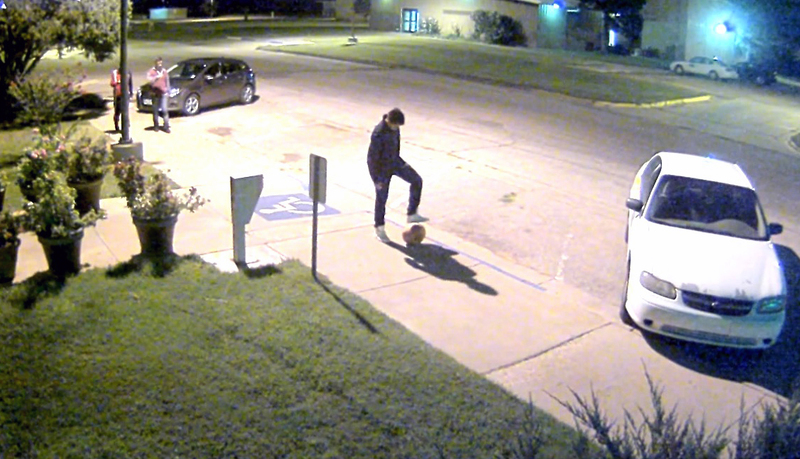 Surveillance footage released Friday showed a group of boys walking around the university at night as one kicks around a pumpkin like a soccer ball. Another boy carried a pumpkin away, the footage showed. School officials found the handful of pumpkins missing and vines destroyed Monday morning. The Portales school's 26 students had studied and watered them since they were sprouts, officials said. Eastern New Mexico University police said surveillance footage of the heist and a tip led investigators to the boys. Footage also shows two other male juveniles involved, and authorities are expected to question them soon, police said. Two of the suspects are 15 years old, and the other two are both 14. Authorities say criminal damage to property and criminal trespass charges are expected. Elaine Gard, the center's director, said most school officials believe the theft was more of a prank than an act meant to hurt the children. Gard said that, since news of the heist spread, the school has received around 40 donated pumpkins, and 150 more were expected. A pumpkin carver from Boston was even sending a specially carved piece with the university's logo, she said.